Images in Class D will appear on the main page 6% of the time. Shown below are the most recent 10 images. For the full list, see here. Think about what you're putting them through at such an impressionable age. 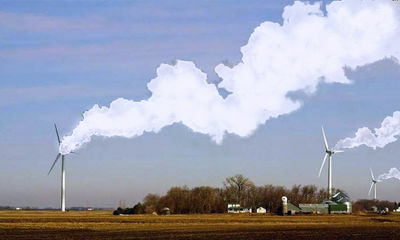 Rationale: Warmists are constantly turning-out images of power stations spewing 'pollution' - actually steam from cooling towers, photoshopped to make it look darker. So, thought I'd do a little potatochopping on one of their pet products, which in this case IS spewing pollution. Although, not intentionally. I hope. 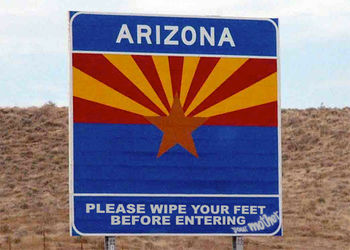 Vote Score: 9 Mothers entered with clean feet. 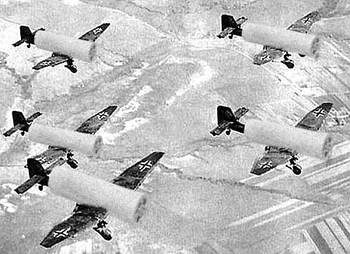 Most people don't remember that during WWII the Germans made huge developments in cleaning their enemies. 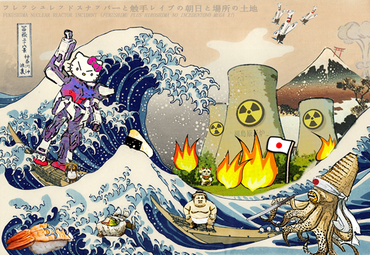 Artist's depiction of the 2011 Fukushima Daichii Nuclear Power Plant Disaster. What it really looked like off the coast of Japan. The Great Wave Off Fukushima. color woodcut. 1823, 1930, 2011-12. Part of The Thirty-six Glows From Plant Daichii series by 250 year old Ukiyo-e (and recently loli) artist Katsushika Hokusai. The Great Wave of Fukushima is part of a groundbreaking new series of remastered prints that comprise the (evidently immortal) artist's comment on both the tragedy of the recent disaster at Fukushima and what he (not exactly a traditionalist himself in his younger days) believes "is representative of the cultural degradation, excess, and perverse fantasy of Japanese today - as well as some floating sushi." To Determine the Motion of a Cat with a Slice of Buttered Toast Strapped to its Back: Let F_c be the attractive forces of each of the cat's feet to the carpeting (not shown), and let F_bt be the net rotational torque imposed by the carpeting upon the buttered side of the toast. By the 42nd proposition of Murphy's Laws, the system will begin to rotate in a counterclockwise fashion, causing the cat (C) to experience a large measure of confusion. The partially-melted butter (B), which is adhered to the toast (T) by comparatively weak Van der Waals forces, is overwhelmed by the large centrifugal fictional force, causing it to splatter all over the place (P). The spinning cat and toast (C+T), having thus divested itself of surplus butter, will then experience tidal drag within the Earth's gravitational field until such time as rotational equilibrium is restored. 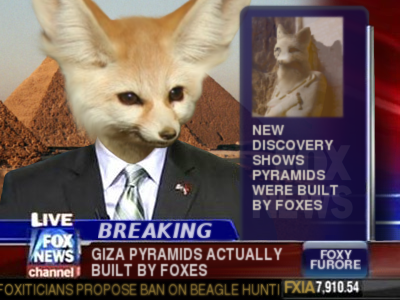 Fox News: Your number one news source for all things foxy. On September 11, 2001, international celebrity Santa Claus shocked the world by first firing a missile at one World Trade Center tower, and then flying into the other tower at top speed, killing thousands. Santa survived using his famous magical powers. 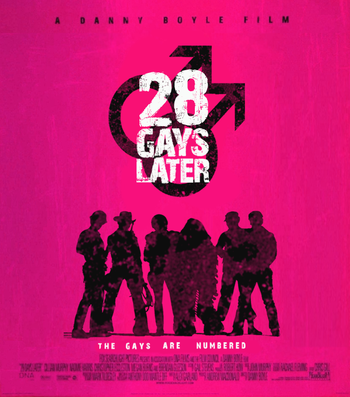 28 Gays Later is a post-apocalyptic horror/shocker film released in 2008. It has become a cult film in the city of San Francisco, as much of its imagery and drama hit home with many fans describing it as the most hoboerotic experience since Top Gun. The film's sequel, 28 Twinks Later, proved to be a box office disappointment.